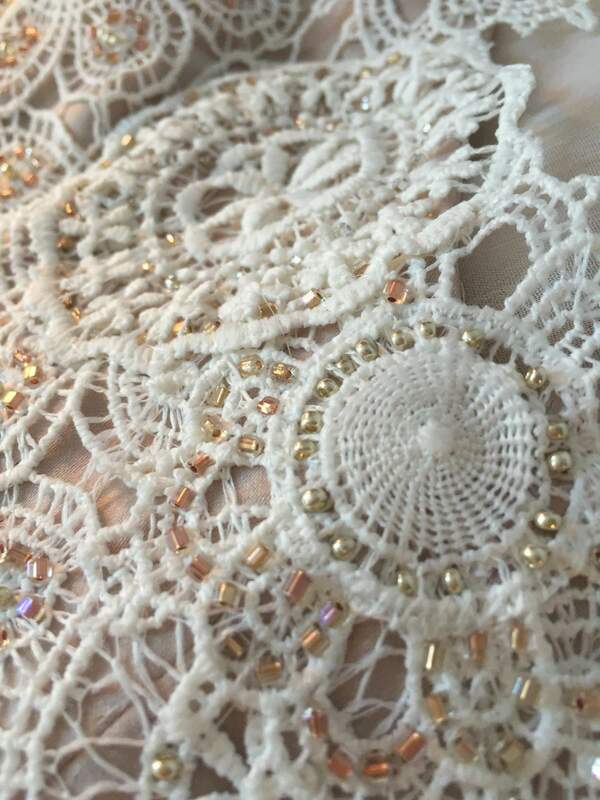 Close-up detail of beading in Jessica's dress. Jess and David at South Pond Farms. Photo by Ash Nayler. Growing up, I never imagined a big traditional or formal wedding day. Sparkling princess dresses and tiaras were never really my thing (welllll, after the age of four…admittedly I did have a phase). 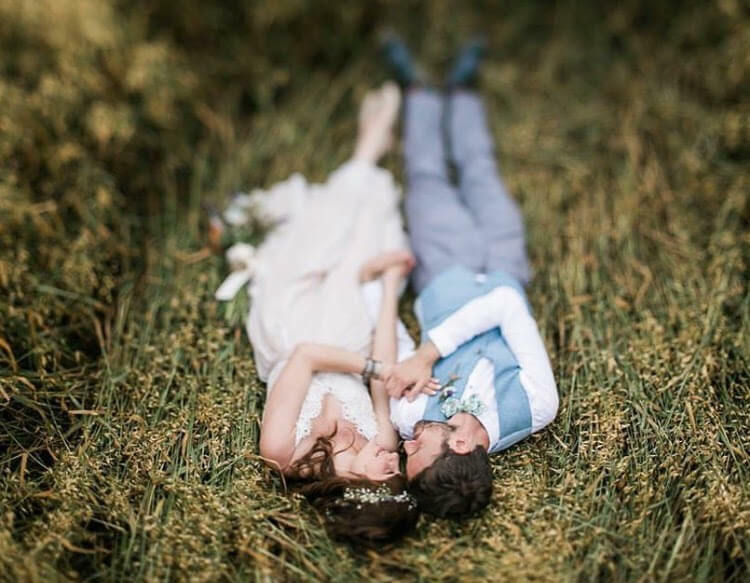 By the time the possibility of marriage was a real thing in my life, I dreamed of doing it in some sort of boho fairyland, maybe on a beach or magical field, where everyone was barefoot and ridiculously free spirited and happy, surrounded by floating twinkle lights and flowers in our hair and a gourmet picnic. 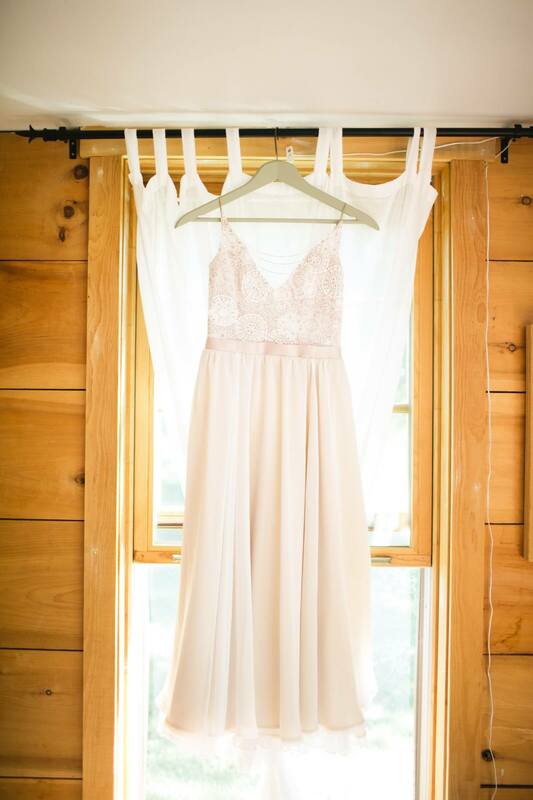 My dress would be airy and twirly and whimsical! There would be ukuleles! And lots of pretty DIY decorations that I would have time to make! Of course, in this fantasy land, I also had no financial restrictions whatsoever. Because come on, in a logical universe, twinkle lights and meadows shouldn’t cost that much, right? If there was an emoji for the COMPLETELY FREAKED OUT face of a bride-to-be when she discovers what her simple, rustic, DIY, twinkle light wedding is actually going to cost, I would insert it now. My fiancé and I were oh so happy and in love but definitely not rich (we’re artists – huzzah!). 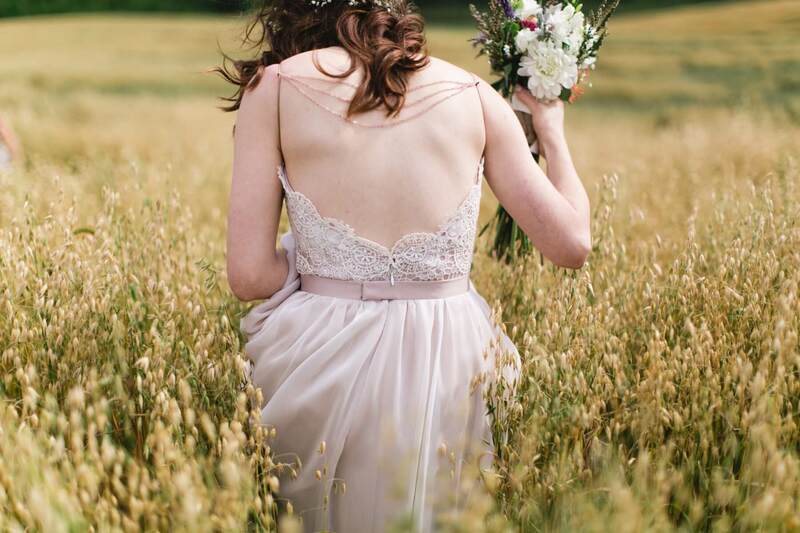 I was so completely clueless about how to plan a wedding, especially one that honoured both the spirit of my original hippie-dippy vision while trying not to completely terrify and alienate our more traditional-minded family members (whom, at first, were legitimately horrified when we told them we actually chose a barn for our venue). The dream (and budget) had to expand to include some more traditional elements and a much bigger guest list. After all the just-basic costs of feeding everyone, hiring our Rabbi and photographer, paying for the venue, etc., there wasn’t much left to dress ourselves. I naively thought that because I wasn’t looking for a ball gown, finding something simple but special and within budget would be no big deal. But I was so horribly horribly wrong. I spent months searching. I started at regular wedding dress stores, then went to wedding dress outlets, second-hand stores, regular fancy non-wedding dress stores, searched online, and even found a big wedding dress blow out event where all the dresses were being sold off for $200 each. I learned that ladies REALLY LOVE big sparkling princess dresses. They LOVE them! And all the power to them! But I never imagined it would be so hard to find something for me. Isn’t boho a thing these days? Pinterest says so! But finding it in life became an impossible task. Only in one beautiful wedding dress store did I find a couple of dream dresses (which later served as inspiration), but I simply couldn’t afford them. 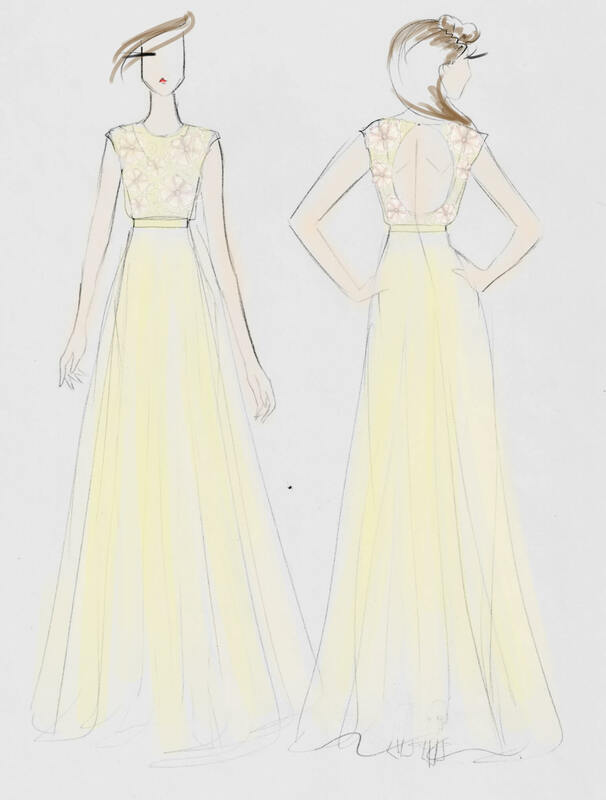 In one of my panicked online searches for new options, I discovered a blog that mentioned Breeyn and her custom dresses. I looked at her website and got excited about the idea — but also quickly dismissed it. I assumed that a custom dress must be more expensive than anything I would find in a store. But after another couple weeks went by with no progress, my mother encourage me to e-mail Breeyn and at least find out for sure. And this is when my dress search went from being one of the most stressful parts of wedding planning, to one of the most joyful and creative. Breeyn got back to me right away. 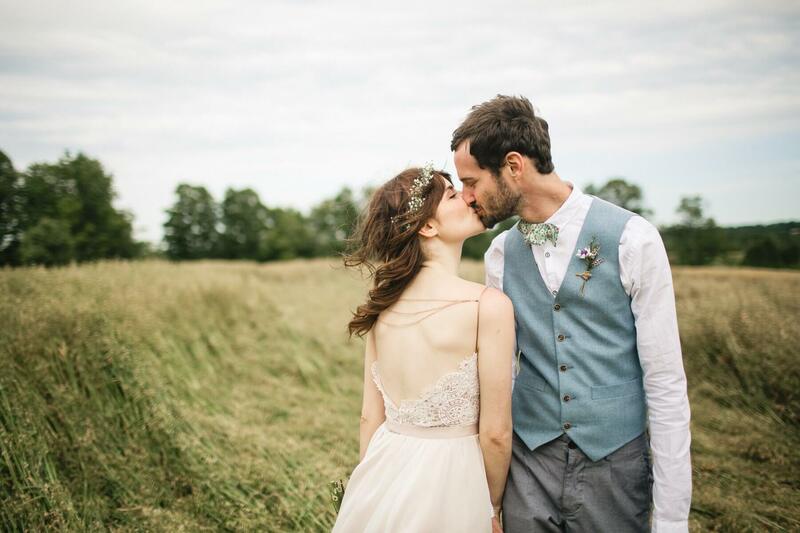 She told me about her process, that we could use fabrics and materials that fit within my budget, and assured me we create something together that would be comfortable and unique for me. After seeing my inspirations, she quoted me something completely reasonable (I’m serious!). She was so great at managing my expectations and assuring me there were no hidden costs (unless I decided to later add on more embellishments or accessories than we planned). 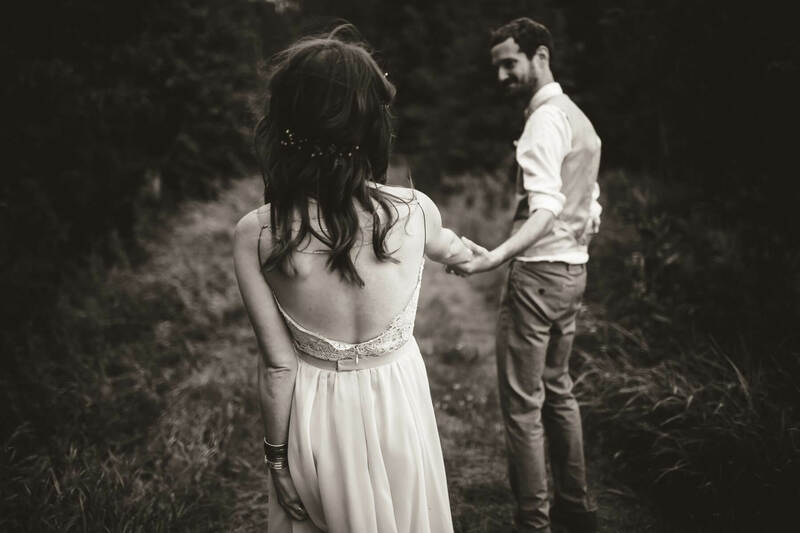 And I loved that it would be built to fit my body – I could trust it would look great on me and I wouldn’t need to spend extra money on alterations. We set up an appointment to meet and discuss all my likes and dislikes. Breeyn is super chill, creative, warm, intelligent, and full of amazing ideas — she put me right at ease and I felt like I had known her forever. We looked through images of dresses I loved, discussed what would look best on my body, and went through a list of things I knew I wanted. From there, she would look for inspiring fabrics and draw three sketches for me. The sketches were all equally beautiful (I’m not joking!). Each dress felt original and special in it’s own way, and had to take time to consider each option and get input from Breeyn and close friends. The trickiest part for me was trying to imagine how the end result would really look, but that’s where I put my faith in Breeyn and the process. At every stage, we could keep checking in and adjusting to make sure it was coming together just how I wanted. 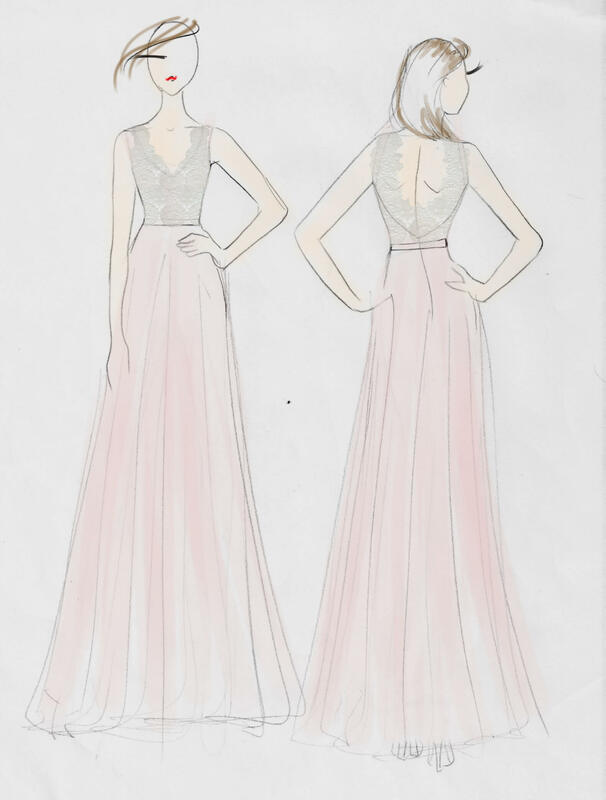 In the end, we chose one dress but incorporated a few of my favourite elements from a different sketch into it. Next, Breeyn had me go fabric shopping with her. I wasn’t expecting to get to be so involved, but I love that she made me part of this process. It was legitimately fun to spend time with her, and I learned a lot about how each element or material could change the dress completely. Although Breeyn guided me and gave honest feedback, making those decisions with her made me trust that the dress would truly be a expression of me and my taste. It was hands on and creative, and I appreciate that she gave me lots of space to give input and speak my mind. I also threw one additional idea at Breeyn. My mother’s wedding dress had been sitting in her closet for 30+ years, and I wondered if there was any material that we take from it and incorporate into my own. 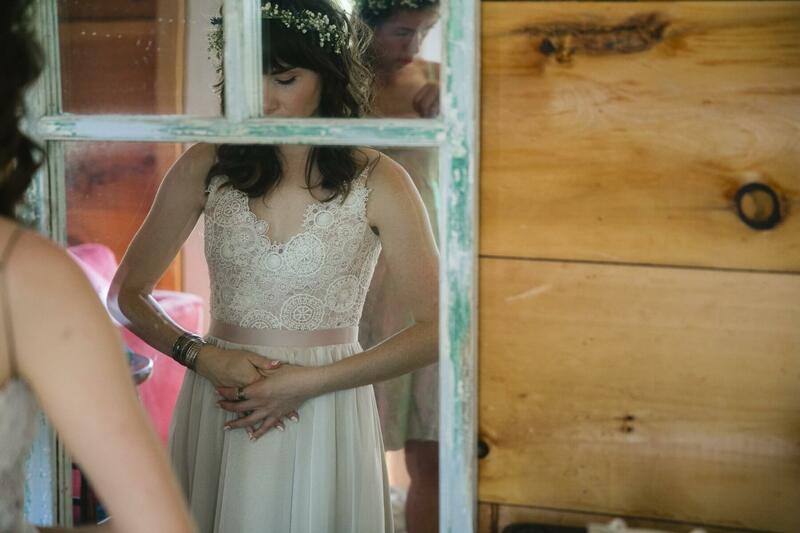 Breeyn was so open and supportive of it and took great care to do so in a way that was thoughtful and didn’t ruin my mother’s dress at all (or alter the vision we originally had for mine). Part of the beauty of having your own dress made from scratch is being able to incorporate those kinds of special details and make it very meaningful. 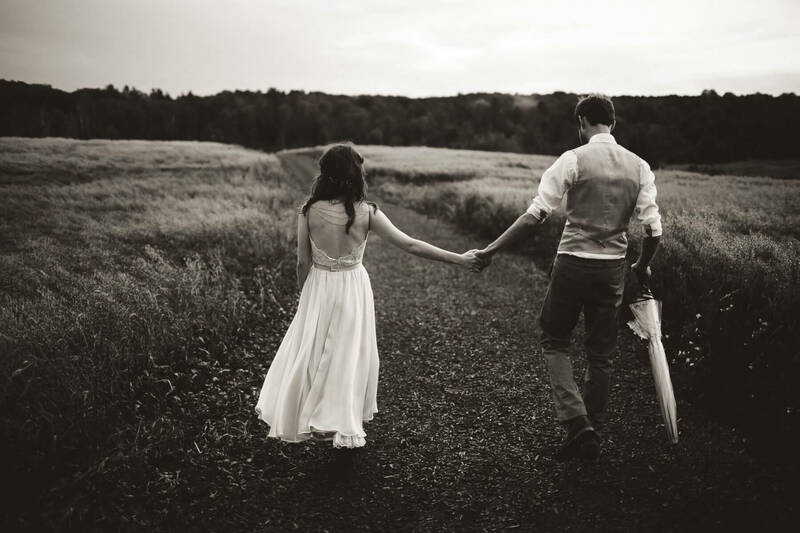 In the months leading up to the wedding day, I would go in for periodic fittings and check-ins. Sometimes I would bring a friend who could give me additional input on certain details I was still deciding on: do I want to add any sequins? Do I add extra fabric here? Should the neckline be deeper? Should I shorten the length? It was so exciting to see my dream dress take shape with every visit. Some magical elements of the dress came as a result of just trying to solve certain problems that came up. For example, I was worried that the ultra thin straps (that I requested) might not stay up throughout the day, and Breeyn thought of adding three gorgeous strings of little beads along the back to help hold them in place. Those exquisite little ideas are what made the dress stand out as much as it did. And the end result? 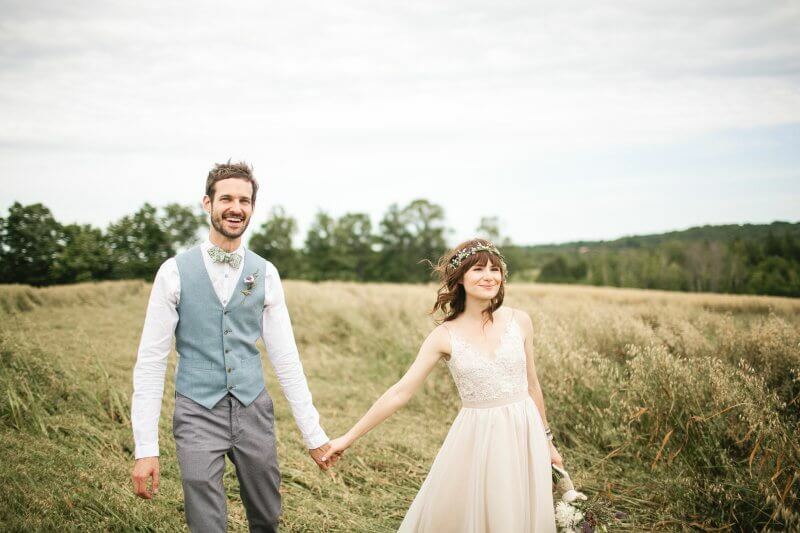 The dress was more beautiful and more whimsical and special than anything I could have imagined or found in a store. It fit me perfectly, was extremely comfortable to wear (to the point that I am still trying to figure out an excuse to wear it again), and I honestly DID feel like a princess in it — but the fairy kind. 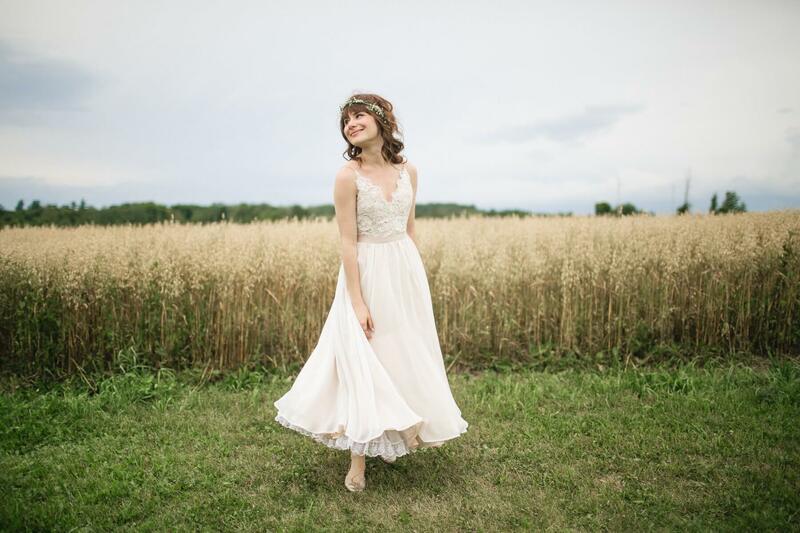 The details on it, from the tiny little sequins she incorporated, to the choice of lace, the flow of the skirt (that I spent lots of time twirling in), the gorgeous open back, the trim of lace from my mother’s dress that Breeyn sewed to the bottom…. it was beyond my wildest dreams. And none of it cost a penny more than what she quoted me. As a last minute request, I even asked her to do up bow ties in different colours for our groomsmen. She did a perfect job. 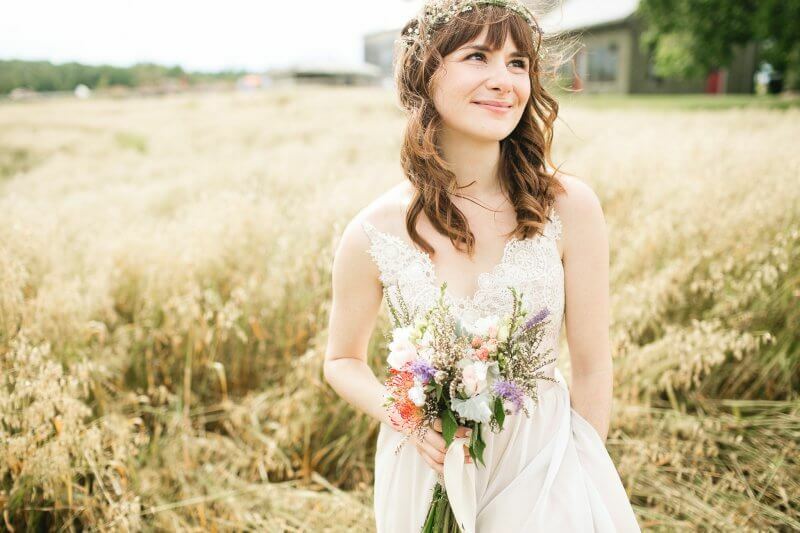 On my wedding day and throughout the year that that has passed, I’ve had so many compliments on my wedding dress and so many people asking me where I found it. But what matters most to me is how beautiful and myself I felt in it, and how much it helped capture the spirit of what I had always dreamed of. I hope I find a million reasons throughout my lifetime to work with Breeyn again. Oh, and our traditional family members? They ended up loving the barn — even with the tornado weather we got that evening. 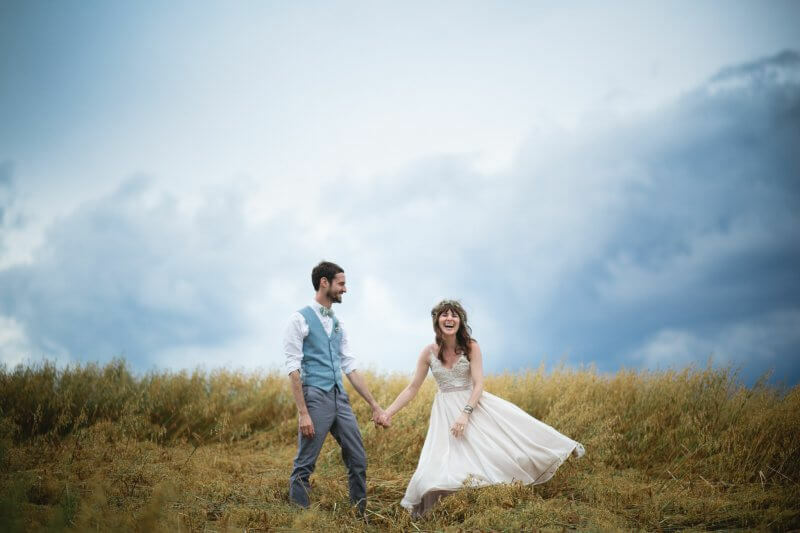 And I got my twinkle light, flowers-in-my-hair, whimsical day in the fields, in an airy fairy twirly dress that I love almost as much as my husband.